University of Michigan Health System research into the mechanisms by which zebrafish are able to regenerate damaged retinas after injury suggests new strategies for one day being able to do the same in humans – potentially allowing doctors to slow or reverse conditions like macular degeneration and glaucoma. 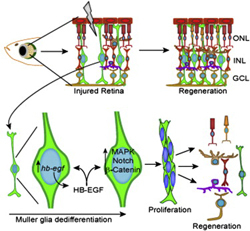 An illustration shows HB-EGF’s influence on retina regeneration. Building on previous studies, Daniel Goldman, Ph.D., a professor at U-M’s Molecular and Behavioral Neuroscience Institute and in the Department of Biological Chemistry, along with postdoctoral fellows Jin Wan and Rajesh Ramachandran, discovered that heparin-binding epidermal-like growth factor (HB-EGF) plays a critical role during retina regeneration. Their findings were published today in Developmental Cell. “We found that this factor is sufficient to activate the whole process,” says Goldman. When a zebrafish’s retina is damaged, HB-EGF is released and sets in motion a series of changes that cause certain cells in the retina known as Muller glia to revert to a stem-cell state from which they can generate new cells and repair the damage. The researchers found that HB-EGF stimulated Muller glia to revert to a stem cell even in fish with uninjured eyes. The next step, says Goldman, will be to explore if this factor and related pathways can stimulate Muller glia dedifferentiation and stem cell formation in mammals.